The end of the academic year is approaching. While summer break is a healthy time for children to relax and recharge, it also represents a long stretch of time away from the classroom. Once the academic year has concluded, parents will receive their child's report card with feedback from the entire year. However, assessing progress in the summer months can leave uncertainty and unanswered questions. From my experience working in the tutoring industry, I find that many families want to be proactive leading up to, and during, the summer months to ensure a smooth transition to the next grade level in the fall. This is why parents should consider having a proactive chat with the classroom teacher prior to the end of June about both academic and social progress. The ideal outcome is to gain direction on where to focus efforts to help students finish the school calendar year with a boost, be engaged over the summer and start off stronger in September. Working directly with teachers from my team, I put together these five questions for families as a guide to kick off the conversation. What are my child's greatest academic strengths? Parents can begin the discussion with positive information to take home and celebrate with their child. Then, over the summer, they can look for opportunities to further develop core strengths with family experiences, specialized summer camps or regular trips to the library. How was my child's progress and achievement throughout the school year? This question helps parents gain insight into how their child is moving along the learning continuum from whichever place they began. Parents can ask to see signs of progress such as samples of their child's work from throughout the year. How was my child's interaction with peers and classmates? Understanding social skills will help paint a more thorough picture of a student's days at school. If a child is struggling socially, parents can strategize with the teacher and come up with some ideas and activities to focus on during the summer. How can I continue to support my child's learning over the summer? Teachers can make helpful recommendations on popular books, games, as well as websites and apps that make screen time more educational. As a bonus, they're often in the know about summer learning programs available in the community. 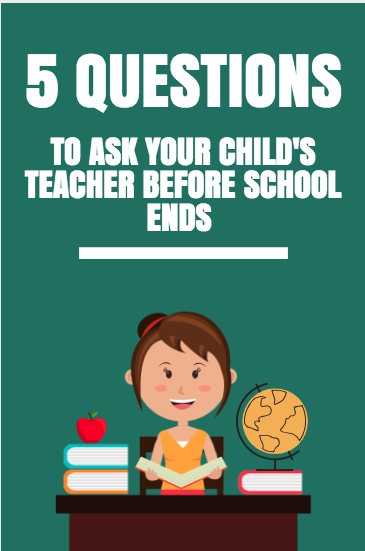 Parents may also use this question to find out areas for improvement and then constructively discuss suggestions to work on over the summer months. How can I help my child in preparation for the next grade level? Whether moving on to a new grade or school, transitions are challenging for children and parents alike. Being well-prepared and setting goals may ease the stress of the unknown by carving out weekly time to work on teacher recommendations, whether it's in math, science, reading or organizational skills. The overall benefit for parents is a clear picture of their child's academic and social standing, with no surprises. Equipped with this feedback and knowledge, families can proactively plan how to incorporate learning into the summer holiday. The secret to summer learning is to make it fun and engaging for students, similar to an extracurricular activity they enjoy. There are plenty of stimulating options for the summer months to choose from, including recreational reading, joining a book club, educational field trips, learning a second language, coding and playing math games. For additional enrichment, parents may also consider working with their child directly, and hiring a peer or professional tutor to provide consistent support in academic areas identified by the classroom teacher and report card. The key is for families to take advantage of this time in the final school stretch. Summer is a great opportunity for students to build upon skills, continue a love of learning and ultimately get a head start for September. The time to prepare is now!